Hosted by the Administration for Children and Families of the U.S.
and innovations in approaching solutions to family homelessness. Free Event. Registration is required and space is limited. communities. We look forward to being in touch again soon. This entry was posted in Best Practices on March 25, 2019 by Pamela Schwartz. The Metropolitan Area Planning Council projects that Massachusetts needs to produce more than 500,000 new homes by 2040 to support the Commonwealth’s existing job base. But how much of this new housing will be affordable to those with extremely low incomes? New research from the New England Public Policy Center at the Federal Reserve Bank of Boston highlights the current shortage of rental homes and rental housing available to households with extremely low incomes. Nick Chiumenti, author of this research, will discuss his findings. Following his presentation, we will explore policies, programs, tools, and strategies for producing homes that are affordable to people with extremely low incomes. Tickets are limited and you must register for this breakfast forum by April 1st. Cost: $25.00 for CHAPA members / $40.00 for non-members. No refunds will be provided to those who register but do not attend the forum. This entry was posted in Best Practices on March 15, 2019 by Pamela Schwartz. The Western MA Network to End Homelessness is pleased to report its submission to DHCD’s Family Homelessness System Request for Information (RFI). Please see the Network response here. The Western Massachusetts Network to End Homelessness is the collaborative vehicle for preventing and ending homelessness in the four counties of Western Massachusetts with a Housing First approach. This RFI response is an outgrowth of a series of meetings through the Network’s Family Services Committee, a committee comprised of over 100 members, including a broad cross-section of all housing and shelter providers, and partners in health care, substance addiction and mental health, domestic violence, child care, education, and workforce development, as well as state agency representatives from DHCD, DPH, DCF and DMH. This Committee selected a targeted number of questions that it felt would best reflect the region’s proposed vision to ending family homelessness. The Network’s Family Services Committee seeks DHCD’s adoption of its recommendations, and looks forward to continuing the work in partnership with each other and DHCD to prevent and end homelessness in Western Massachusetts and the Commonwealth as a whole. Congratulations to all for the excellent work and the amazing partnership! This entry was posted in Best Practices, Family Services Committee on February 15, 2019 by Pamela Schwartz. 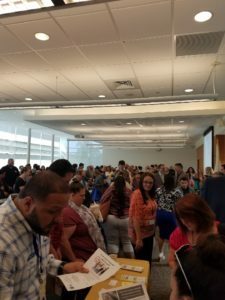 On Thursday, June 14, the Western MA Network to End Homelessness convened its second annual Homelessness Resource Fair for Providers. Congratulations to all for a tremendous success! 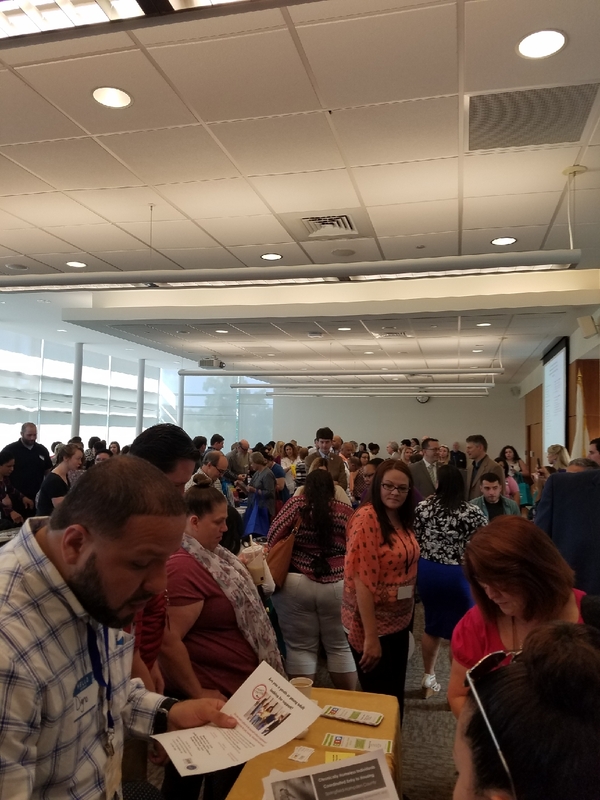 Over 200 people attended from across all four Western counties; 60 organizations from every sector of our community shared information and resources available to assist in preventing and ending homelessness. 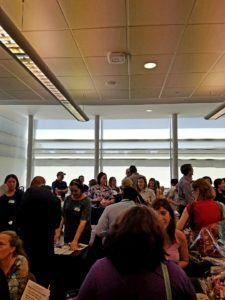 8 workshops were offered (twice! ), facilitated in partnership by over 20 Network partners, on topics ranging from the opioid epidemic to EA/HomeBASE to domestic violence, youth homelessness and more. 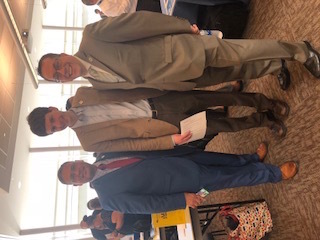 Western MA state legislators turned out to support our efforts: Special thanks to Representative Aaron Vega, Representative Jose Tosado, Representative Michael Finn and Representative Solomon Goldstein-Rose. 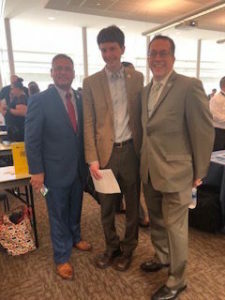 Senators were meeting in Boston that day but we had the honor of welcoming legislative aides from the offices of Senator Adam Hinds, Senator Carlos Gonzalez and Senator Donald Humason. A huge thank you to Holyoke Community College and so many of its staff for their extraordinary support around this day. They made it possible! The shared commitment and energy among the hundreds in the room was palpable (and fear not, we already know how we will create more room to move next year!) . The determination to connect, to learn, to maximize every opportunity to prevent and end homelessness among the people of Western Massachusetts brought our entire community that much closer to our goal. Buoyed by comradeship and knowledge, we will continue the work! This entry was posted in Best Practices, Resources on June 15, 2018 by Pamela Schwartz. This entry was posted in Best Practices, Resources on June 1, 2018 by Pamela Schwartz. Former USICH Executive Director Barbara Popperecently completed a study with Your Way Home in Montgomery County, PA, to help develop a community-wide homelessness and eviction prevention strategy. Barb shares the key takeaways from the study. This entry was posted in Best Practices on May 7, 2018 by Pamela Schwartz. The United States Interagency Council on Homelessness (USICH) is currently gathering comments from stakeholders throughout the country as it prepares to revise and strengthen the Federal Strategic Plan to Prevent and End Homelessness. As part of that process, USICH staff will be holding a listening session in Boston on December 6, 2017. This session seeks input from people who have experienced homelessness, service providers, advocates, and government officials willing to share their recommendations. The meeting is an important opportunity to ensure that our regional voices are heard as the updated plan is developed. The current Federal Strategic Plan, Opening Doors, has helped drive significant national progress. But there is much more work ahead. You can review a summary of the goals, objectives, and strategies within the current plan in this Participation Guide. The listening session will be led by Robert Pulster, USICH Regional Director. The meeting is sponsored by the Region 1 Federal Regional Interagency Council on Homelessness and will include representatives from other federal agencies. HUD will host the meeting at its offices at 10 Causeway Street in Boston on Wednesday, December 6th, from 10:30 a.m. to 12:00 p.m. Participants are asked to RSVP by December 1st by emailing Josephine Hauer, Program Specialist for Strategic Initiatives at HHS, Administration of Children and Families: at josephine.hauer@acf.hhs.gov. Please note that you must pass through building security, so please plan accordingly. If you are unable to attend the listening session but wish to provide feedback, USICH is soliciting input until Dec. 31. Comments can be filed on the USICH website at https://www.usich.gov/strengthening-the-plan. Thank you and we hope to see you there. This entry was posted in Best Practices on November 26, 2017 by Pamela Schwartz. We invite you to participate in next Wednesday’s Amherst Housing Forum (October 25). We have new data and new ideas to share with the community. We expect to engage in interesting and valuable conversations about what we can do to address our local housing problems. During the past 10-15 years, Amherst has lost an estimated 800 households with children under 18, according to US Census data. Significant numbers of homeless individuals are served each year by local service providers, but rarely placed in housing. Barriers to developing new affordable housing in Amherst for both individuals and families often appear insurmountable. What can we do? These are the issues to be addressed by this Forum. We are bringing together persons from both within and outside Amherst to lend their knowledge and experience to these issues. But most importantly we are convening the community to discuss and develop ideas about what we can do to make changes. This is a collaboration of the Amherst League of Women Voters, the Amherst Municipal Affordable Housing Trust, Valley Community Development Corporation, and the Unitarian-Universality Society of Amherst. It is set for Wednesday, October 25, 7 P.M. in the Social Hall of the Unitarian Universalist Society, 121 N. Pleasant St, Amherst. The sponsors wish to encourage the broadest possible participation in this Forum. This invitation was also sent to other individuals and organizations in Amherst. However, we probably did not include everyone we should have. So please forward this to anyone you know who might be interested, even if that results in some duplication. Also, a flyer about the event is attached for posting. P.S. Looking for more detail? (1) An introduction and presentation of what the Trust and the Town are doing to address issues of both affordable housing and homelessness in the past year. (2) This will be followed by a panel presentation on the development of a small, studio apartment building in Amherst to serve the needs of persons who have very low incomes or are homeless. Encouraging and Supporting Development: How can Amherst best leverage available resources to maximize affordable housing? What are the barriers to affordable housing: What changes are needed? Changing the Amherst housing market: Developing Town and University policies to assure greater access to housing. This entry was posted in Best Practices on October 19, 2017 by Pamela Schwartz.